The Alberta government has introduced new legislation that would give the province the power it needs to restrict the export of natural gas, crude oil and refined fuels across its borders. 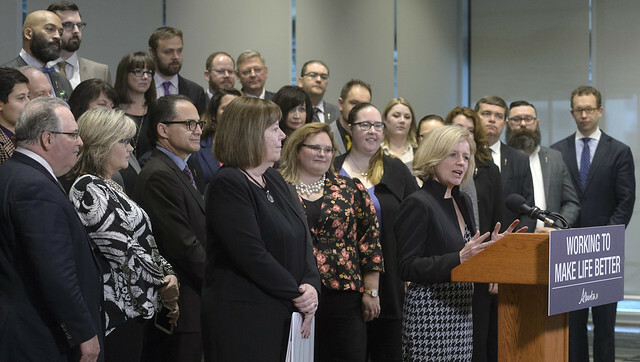 Premier Notley and Minister McCuaig-Boyd announce new legislation giving Alberta the power to control the oil and gas resources that belong to all Albertans. In the face of ongoing challenges threatening the construction of increased pipeline capacity, the Alberta government is acting to defend its energy industry. Roadblocks put in place by the British Columbia government have caused uncertainty and hurt investor confidence, resulting in pipeline delays that have caused the Canadian economy to lose out on millions of dollars in revenue every day. That revenue could have been used to build roads, schools and hospitals. These delays are also affecting the hundreds of thousands of jobs that help put food on the table and a roof over the heads of families across the country. The government made it clear through its throne speech that it would not hesitate to take bold action similar to the action former Premier Peter Lougheed took when Alberta’s energy industry was threatened in the past. If passed, the legislation would give the government authority to, if necessary, require any company exporting energy products from Alberta to obtain a licence. These products include natural gas, crude oil and refined fuels, such as gasoline, diesel and jet fuel. Export restrictions could be imposed on pipelines, as well as transport via rail or truck. This licence would be issued by the minister of energy if it is determined to be in the public interest, including whether adequate pipeline capacity exists to maximize the return on these resources produced in Alberta. Companies would not be automatically required to apply for an export licence and would only be directed to do so if the minister deemed it necessary. Consideration would also be given to ensuring enough supply is maintained for Alberta’s needs, now and into the future. A licence could be issued to a company but for a lower amount than it has previously been exporting. Companies that do not comply with the terms of a licence issued could face fines of up to $10 million per day. Individuals could face fines of up to $1 million per day. Imports of products into Alberta are not currently subject to any restrictions. Approximately 80,000 barrels a day of refined fuels goes to B.C. on all modes of transportation, based on internal government estimates.